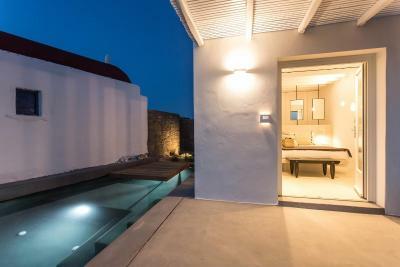 Lock in a great price for Ostraco Suites – rated 8.9 by recent guests! Comfortable, beautiful, luxurious everything! Great location, breakfast was outstanding, pool food and drinks were great, staff was exceptional! They went above and beyond to make our stay wonderful! Very helpful front office staff. Excellent minimalistic room decor. The staff are so welcoming and friendly, they went out of their way to make our stay extra special! The ostraco Breakfast is amazing such a great variety to choose from and in such a beautiful setting! Lovely pool area with very comfy double sun loungers, refreshing cucumber water available at the pool all day which I thought was a lovely touch! 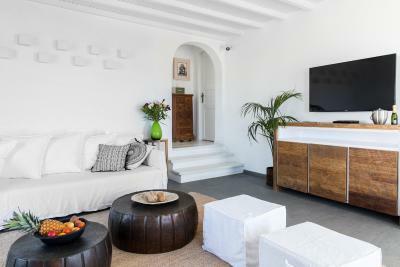 The ostraco suites is a great location with a shop and bakery a 2 minute walk and town about a 10 minute walk down hill and about 15 minutes back up, ornos beach is also two stops on the local bus which comes every half an hour! 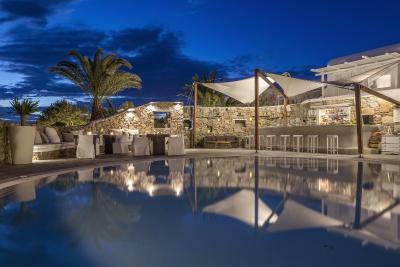 Cannot recommend The Ostraco Suites enough, best hotel in Mykonos! We had a recommendation from a friend and it did not disappoint. Friendly staff :) Overall design and pool area is great! Breakfast, lunches and cocktails also very good. Staff are amazing, Vance the bar man was super excellent! Great location to town , lovely hotel , staff very friendly and helpful ! 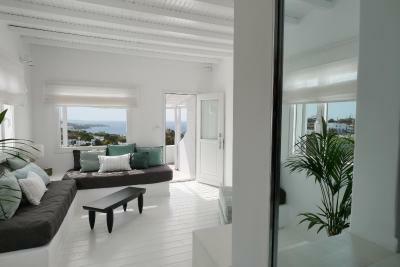 We loved this property in every way, the staff, facilities, value for money (off season) and the design of this property. We only have 1 negative comment to make is the attitude of the staff member in charge of the Front Office during the day. Rude, unfriendly and really wasn't pleasant. No more details needed, just a pain. 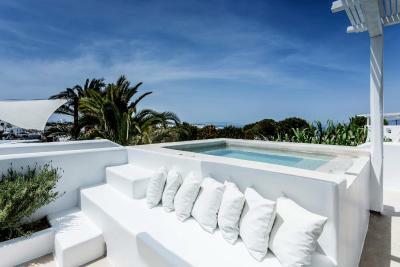 Ostraco Suites This rating is a reflection of how the property compares to the industry standard when it comes to price, facilities and services available. It's based on a self-evaluation by the property. Use this rating to help choose your stay! 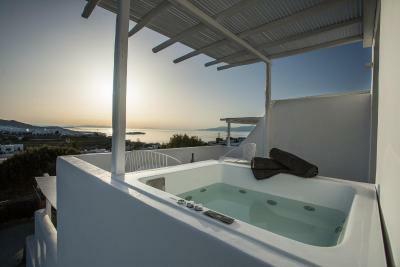 Located on a hilltop, the Ostraco Suites offers breathtaking views over the Aegean Sea. 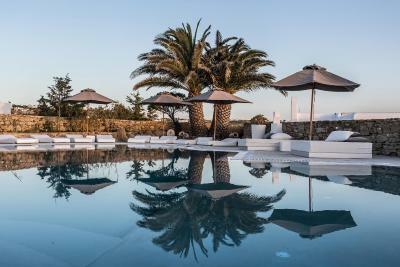 This luxury boutique hotel features a freeform pool with a sun terrace and a stylish cocktail bar. 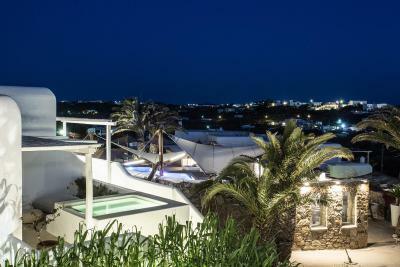 Mykonos Town is 1,950 feet away. 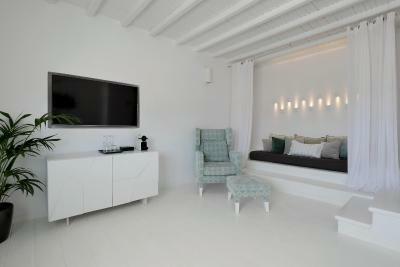 The individually decorated Ostraco Suites reflect the distinctive Mykonos island aesthetics. 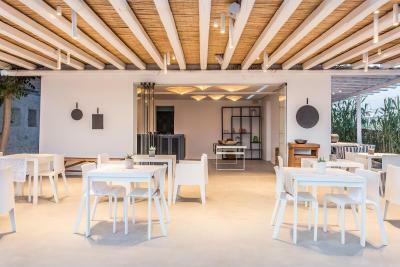 Each is spacious with white-washed walls, stylish furniture and sunny terraces with stone-paved floors. Your day starts with a la Carte breakfast, served at the beautiful pool area, between 8:30 and 11:00, and prepared right in front of you. Throughout the day the bar serves cocktails and a variety of drinks. 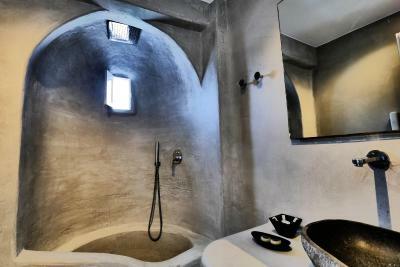 The hotel spa offers a variety of treatments. The attentive hotel staff is available 24-hours a day, offering car rental services and arranging boat and plane trips. When would you like to stay at Ostraco Suites? 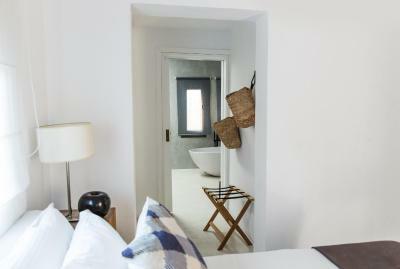 Generously sized suite with sea view and a big terrace. It features a bedroom with handmade wrought iron queen-size bed and a living room. With garden or side sea view, this spacious and tastefully decorated room offers an exquisite bathroom with free standing bathtub and/or rain shower. - early check-in and late check-out subject to availability. 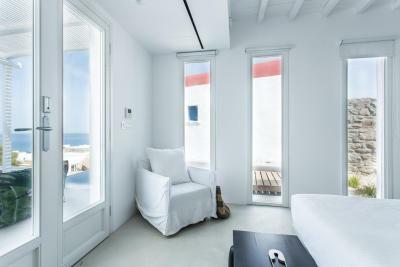 minimal decoration and enjoys sea or side sea views. On an upper floor, this elegantly decorated suite consists of 2 bedrooms, one with private bathroom, and spacious living room. 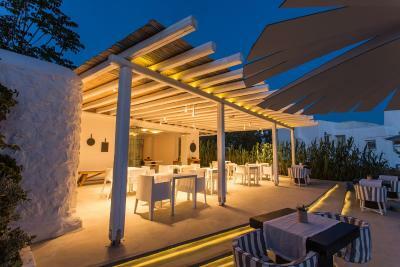 It opens to terrace with Aegean Sea view. This room type can accommodate 2 extra beds. Please see hotel policies. 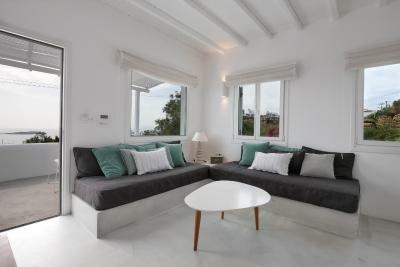 Featuring Mykonian decor with stylish furnishings, this air-conditioned room offers garden views. This double room has a balcony, soundproofing and spa bath. 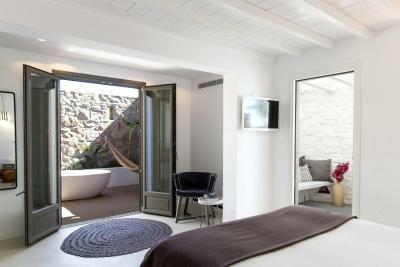 Ostraco is a small luxury boutique hotel that gives emphasis to detail and design. We are aiming to offer personalised service. 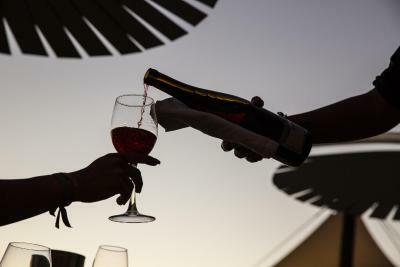 We value our guests needs and we do our best as a team to offer them extraordinary experiences. 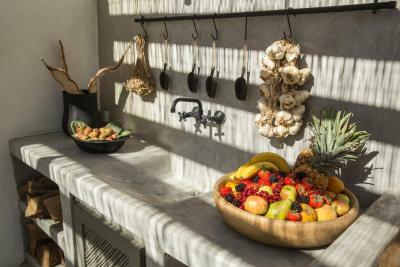 House Rules Ostraco Suites takes special requests – add in the next step! One child from 2 to 12 years is charged 25 % of the room stay per night and person in an extra bed. One older child or adult is charged 35 % of the room stay per night and person in an extra bed. Ostraco Suites accepts these cards and reserves the right to temporarily hold an amount prior to arrival. Kindly note that for group reservations of 3 rooms and more, different policies and additional supplements may apply. 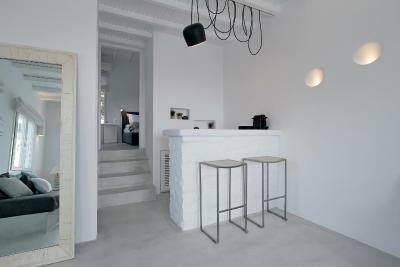 This property is a member of "Les Collectioneurs". There is nothing we didn’t like! We could not find fault with anything! The ambience, service and staff were exceptional! Even the hotel is near town (10’ walking) there’s no really a pathway...you’ll need to walk in a rout near cars to get there. I recommend to rent a smart car for going to town and walking around. Transport generally is a bit of a pain on the island and very expensive. We stayed for 7 nights, a big holiday for us, and think that the transfer especially to the airport (5min away) should have been cheaper than the port transfer or complimentary. Top Location, Very professional staff. 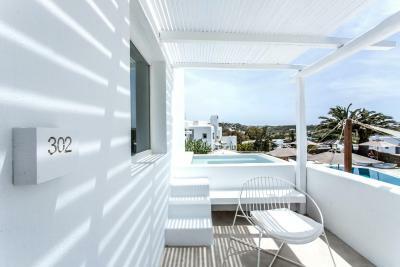 Mykonos is just very expensive; it would be nice to get more bang for your buck. The hotel lacked the finesse that can be expected in a hotel at that price; cheap towels, no bathrobe, no complimentary water etc... The room had very little privacy. We booked a superior room sea-view room and specifically asked for a room on upper floor, but we got one on the ground floor facing the reception area for all other guests and staff to look straight into. The toilet doesn't have a real door, just a glass swivel which can be awkward for some. I didn't receive the actual room that I had specifically booked which was disappointing....but my room was still lovely and Spyros EVERYDAY went out of his way to make sure I was happy.